Please enter any applicable personalization info here (name, age, font choice, etc). If you do not want personalization, please enter NONE. 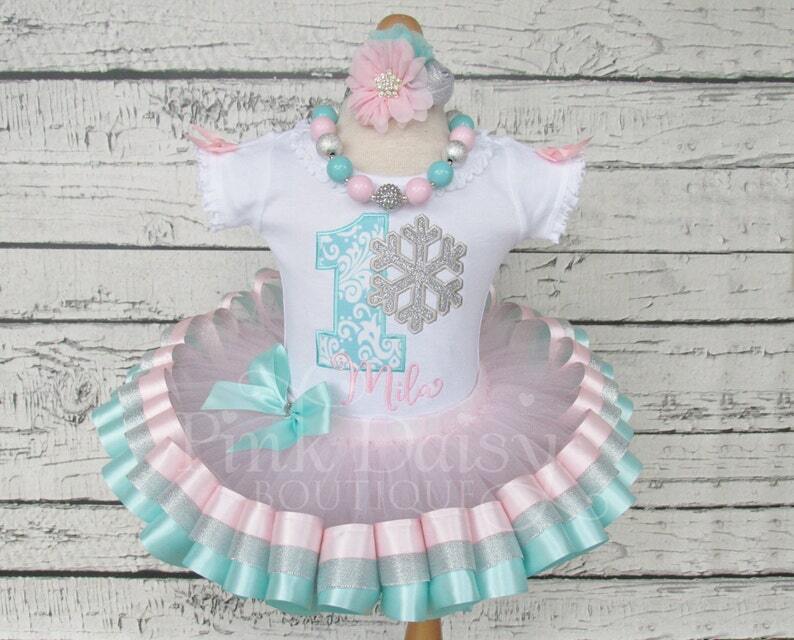 This listing is for a beautiful snowflake birthday set in light pink, aqua, and sparkling silver consisting of a personalized embroidered shirt and tiered ribbon trimmed tutu. You have the option to add the matching headband and chunky beaded necklace. 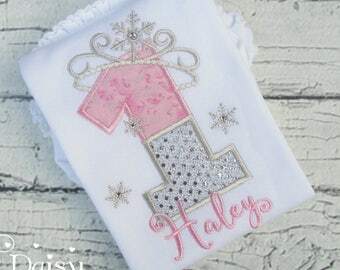 SHIRT: The shirt features the birthday girl's name and age alongside a sparkling silver snowflake! ***Please Be Sure to Leave the Name and Age Needed in the 'Notes to Seller' Section at Checkout. *** Bows are attached to each sleeve. *Bows will not come on long sleeve shirts. 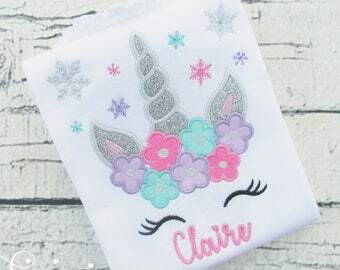 * All embroidered items are finished with a soft backing to protect sensitive skin from scratchy stitches. Wash inside out on gentle cycle and hang to dry. Do not use bleach. Iron inside out on low heat without steam. TUTU: The tutu is sewn and features gorgeous tiered ribbon trims. All of my tutus are made on a no-roll elastic waistband using yards and yards of soft nylon tulle. Due to the sheer nature of tulle and the short length of the tutu, bloomers are recommended to be worn underneath. 6m: Waist 15" Length 6"
12m: Waist 16" Length 6"
18m: Waist 17" Length 6"
24m: Waist 18" Length 6"
3: Waist 19" Length 8"
4: Waist 20" Length 8"
5/6: Waist 21" Length 8"
6X: Waist 22" Length 9"
HEADBAND: The matching headband features beautiful flowers made from high quality materials such as satin and chiffon and is embellished with rhinestones and/or pearls. Flower/rhinestone style and placement may change depending on stock, but will always match your outfit. NECKLACE: The necklace is made on strong, durable wire and closes with a toggle clasp. My necklaces measure approximately 16" in length, which is perfect for ages 1-3. I can make them longer or shorter - just leave me a note in the notes to seller section at checkout with either the age of the necklace wearer or the length you'd like me to make it. Beads may vary depending on stock. Colors may vary slightly due to variations in monitor settings. WARNING: Hair accessories and jewelry may contain small parts that could pose a choking hazard for young children. Please use only adult supervision only! Please add my shop to your favorites...new items will be added frequently! As always, THANK YOU for shopping at Pink Daisy Boutique! 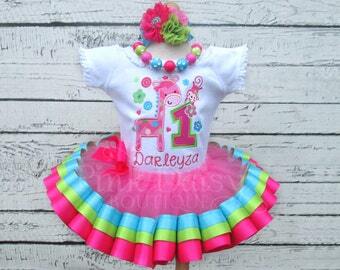 Girls Pink and Aqua 3D Cupcake Appliqué Shirt and Ribbon Trimmed Tutu Birthday Outfit with Matching Headband and Chunky Necklace. Got this in the mail yesterday and it is perfect!!! Highly recommend!!! 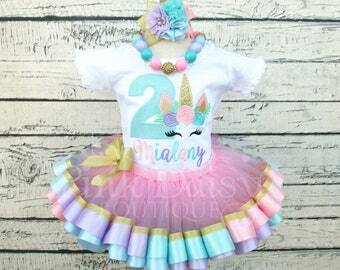 The Birthday outfit for our granddaughter, Winter Grace was absolutely Gorgeous!! We received so many compliments on how beautiful she was and how perfect and beautiful her outfit was. The fit was perfect and the workmanship was beautiful! Thank you so much! 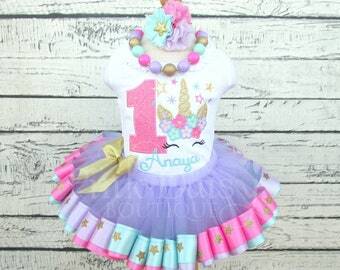 Thank-you for the cute birthday outfit!! 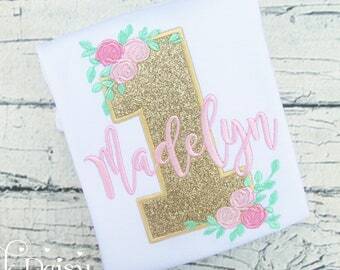 It was so well made and looked great for our daughter’s first birthday pictures!! I accept Paypal, all major credit cards, and Etsy gift cards, but I strongly prefer Paypal. You can pay with Paypal using any major credit card, even if you don't have a Paypal account: From your Etsy cart, click the green "Checkout with Paypal" button. It will take you to a Paypal screen where you can either "Log in" or "Pay with Credit or Debit Card". Select the "Pay with Credit or Debit Card" button and proceed through the checkout process. Let me know if you have any questions. Order cancellations will be granted ONLY if requested within 24 hours of placing the order, with the exception of rush orders, custom orders, and orders that I have already begun working on. After 24 hours have passed, all sales are final and there will be no returns, refunds, or exchanges. I have posted my production time in multiple places throughout my shop to make sure that it is highly visible and doesn't come as a surprise. For this reason, refunds will not be issued if you need your item to arrive sooner than my production time (unless requested within 24 hours of order being placed). 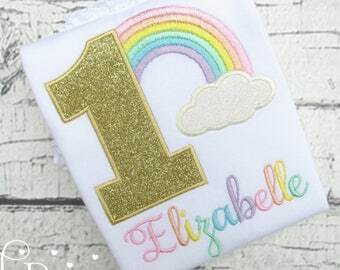 If you do miss my production time and need your order to arrive sooner, I will offer to rush your order for an additional fee if I am available to do so. If I am unable to rush your order and shipping it as scheduled will cause it to arrive too late for your event, you may apply your payment towards a different item in my shop IF I haven't already started working on your item(s). Simply leaving a need by date at checkout does not guarantee that your order will be delivered by said date. If an order is needed sooner than my stated production/shipping time, you must message me prior to placing the order to discuss whether I am able to ship in time for it to arrive when you need it and whether rush fees will be required, otherwise, normal production/shipping times will apply. If I agree to ship your order in time for delivery by a certain date and you then leave a different date in the notes at checkout, your order will be shipped in time to arrive by the date we agreed upon, NOT the date you left at checkout. Personalization for items that require it must be typed into the "Notes to Seller" box during checkout. If the name/age/etc. is not left in the notes at checkout, I will send one message via Etsy convos to attempt to obtain the information. If I do not receive a reply, the item will be made exactly like the first photo in the listing you purchased, but with no name. The only exception will be if the size and number don't match up. 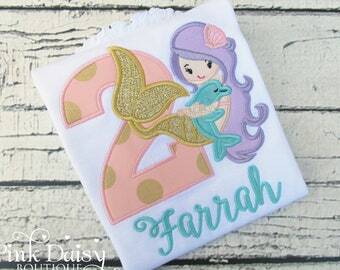 For example, if the listing shows a birthday shirt with a number 1 on it for a first birthday, but you order a size 6 and then don't reply to my message requesting personalization details, then I will make the shirt without a number, or with the child's first initial (if I have that info) instead of a number. Please be aware that, when different colors are requested, fabric/ribbon/bead/etc. prints/patterns in your final product may vary from those used in the original listing. (Ex. 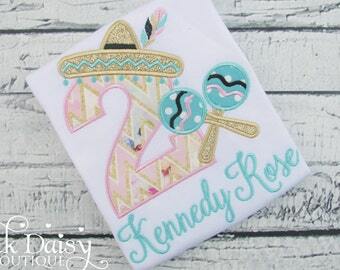 Listing shows a shirt with a green polka dot number and you request I change the number to pink. I will try to do a pink polka dot number but, if this is not possible, you may receive a pink damask number.) I do try to keep them similar, but that's not always possible. If you want a certain pattern used, you MUST specify that in the "Notes to Seller" box during checkout. If you do not specify that you want a specific pattern and decide that you are unhappy with the pattern I use, there will be no refunds/remakes/exchanges. 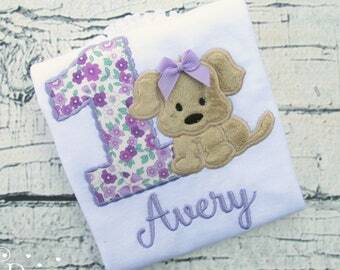 All elements of my work, including but not limited to fabrics, fonts, patterns, colors, ribbons, beads, rhinestones, trims, etc., are subject to availability and may be substituted when necessary and without notice. Substitutions will always be as similar as possible to the item pictured. Measurements given on size charts are approximate and may vary slightly. In the rare event that ruffle shirts/bodysuits are out of stock, a plain shirt/bodysuit will be used instead. The sizing on plain shirts/bodysuits may be marked differently than the ruffle shirts/bodysuits, but the measurements will be very similar. If you receive your package and a mistake has been made on my part, you must notify me within 3 days (72 hours) of package delivery so that I can promptly correct the situation. All items are shipped via USPS First Class Mail, USPS Priority Mail, or USPS Priority Express Mail, depending on the most economically efficient shipping method for your package and which option you selected during the checkout process. All items are shipped with Delivery Confirmation and a Tracking Number is provided. I can not be held responsible for your package after it has been scanned "Accepted" at the Post Office. If there are any issues after this point, you will need to contact the Post Office. I do not guarantee delivery dates and I am not responsible for post office damage or delays. If I can show via tracking that I shipped your order with enough time for it to get to you based on the transit times provided by the USPS, but it doesn't arrive on time, I cannot issue a refund. The only exception is if you paid for Priority Express shipping, in which case I will refund you only the shipping charges and only after I receive the shipping refund from the USPS. The only guaranteed shipping method offered by the USPS is Priority Express, so please keep that in mind when selecting your shipping method. If your tracking shows 'delivered' but you do not have it, please check with your neighbors and check all possible places the mailman could have left it. If you still do not find it, please contact your local post office. International shipping is available; if you do not see the option for international shipping on the listing that you need, please message me before ordering so that we can discuss the cost of shipping to your location and get a listing set up for you. Any customs fees, taxes, duties, etc. are the sole responsibility of you, the customer. Orders will only be shipped to the address you provided at checkout, so please double check that it is correct and current. Refunds will not be issued for orders delivered to the wrong address. If you want insurance on your package, please let me know prior to checking out. PRODUCTION TIME is currently 3 WEEKS on all items. Please allow that full amount of time PLUS approx. 3-5 business days for domestic shipping/2-6 weeks for international shipping. Orders ship 3 weeks from the date the order is placed. If your ship date falls on a weekend or holiday, your order will ship the following business day. NOTES TO SELLER are not reviewed until I pull your invoice to order your shirt/supplies. This can be a week or more after your order is placed, so it is very important that you send me a direct message through Etsy if you have a question about your order/ship date/etc. If you need to get in touch with me, please message me through the Etsy website, do not send an email. 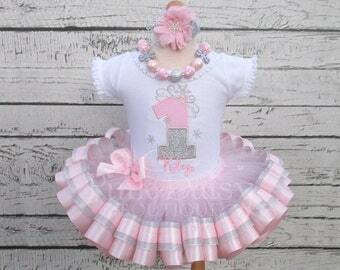 Girls Pink, Mint, and Gold Royal Princess Appliqué Shirt and Satin Ribbon Tutu Birthday Outfit with Matching Headband and Chunky Necklace. Girls Pink and Gold Elegant 3D Cupcake Appliqué Shirt and Ribbon Trimmed Tutu Birthday Outfit with Stacked Boutique Bow and Chunky Necklace.